For these reasons, I decided to create the Jolt bootloader. The Jolt bootloader is a combination of a bootloader application that runs on a PC or Unix workstation and a bootloader firmware that runs on the PIC18 devices. August 25, 2005: Released version 1.2 of the bootloader application. Added ability to bootload a file from the command line. March 12, 2005: Released version 1.1 of the bootloader application and version 0.12 of PIC18F firmware for models that have 2 kb boot block. Fixed problem with loading of Configuration bits from HEX file generated by HI-TECH compiler. August 17, 2004: Released version 1.0 of the bootloader application and version 0.12 of PIC18F1X20 firmware. Added support for numerous new devices, including configurable support of Configuration bits. May 14, 2004: Released version 0.1 of the Colt bootloader application. This version is a stand-alone compact version that does not require Java Runtime Environment. See the Colt Web page. November 18, 2003: Released version 0.9 of the bootloader application. Fixed port lock up problem (for real). Implemented better support for PIC18FXX39 devices. Revisited support of Config bit configuration for all new devices. September 18, 2003: Released version 0.8 of the bootloader application. Fixed loading of EEPROM data. Fixed port lock up problem. Added support for French language. Added support for several new devices. August 30, 2003: Released version 0.7 of the bootloader application. Fixed problem that prevented bootloading of PIC18FXX20. Adjusted Config settings for all models of PIC18FXX20. July 23, 2003: Added hardware schematics to show how to connect microcontroller with bootloader firmware to a PC. July 20, 2003: Released version 0.6 of the bootloader application. Support for recent files access. Fixed open dialog file filter problem. Support for PIC device configuration file. Added installer functionality for Windows. January 27, 2003: Released version 0.5 of the bootloader application. Fixes a port lock up problem on Linux and a Device ID issue for PIC18FXX8 family. December 10, 2002: Released version 0.4 of the bootloader application. The bootloader application now contains a help section. December 2, 2002: Released version 0.12 of the bootloader firmware. Minor change that fixes interaction problem with motor controller (CCP1) during bootloading. November 22, 2002: Released version 0.3 of bootloader application. Fixed problem with autoload and port in use. Tested Linux support. Added help on mousover in Edit Config dialog. Added documentation for Linux and code relocation. November 16, 2002: Added a Menu Description section. November 15, 2002: Released version 0.2 of bootloader application and version 0.11 of the bootloader firmware. Added two second startup delay. Added autoload, autoreset and autoprogram. November 8, 2002: First version released. The Jolt bootloader firmware uses the first 512 bytes of code space (boot sector). The extended version uses a little bit more than 512 bytes. The Jolt bootloader firmware requires pin C7 to be high when idle. If this is not the case in your circuit, pull pin C7 up (e.g. tie it to Vdd with a 10K pull-up resistor). When the PIC is connected to a MAX232 chip, the RC7 line is high when idle, so in this case, there are no special requirements. The user code needs to be relocated to address 0x0200 or 0x0800. The interrupt vectors needs to be relocated to addresses 0x0208 and 0x0218 or 0x0808 and 0x0818. See section How to Relocate User Code for more details. The Jolt bootloader requires installation of JRE and Communications API. RXTX package must also be installed on Linux machines. The Jolt bootloader firmware is based on Microchip PIC16F/18F bootloader firmware. The bootloader firmware can be written to the boot section of the PIC18F chips. This boot section can be independently boot protected. A nice feature of this bootloader is that it automatically detects the baud rate at which it should run. This means that you do not require a .hex file for different baud rate or clock speed. Also, I have modified the firmware to allow for a two seconds delay on startup to trigger bootloading operations. Can be used to view the Config bits in a readable format. Allows programming of Config bits and EEPROM data. Implements a faster verification procedure (only verifies the area of memory that is programmed). The bootloader application runs on Windows, Linux, Mac OS and Solaris. Starting with version 1.1, Jolt requires JRE/J2SE 1.5 or later. The Jolt bootloader application is a Java application. To be able to run it, you first need to install Sun's JRE or J2SDK and the Java Communications API library. You can find JRE and JDSK on the Java 2 Platform Standard Edition Download page. If you don't plan to write Java applications yourself, I recommend that you install the JRE instead of the J2SDK. Sun has released in Nvembre 2005 version 3.0 of the Java Communications API. However, to my demise, a Windows download of the Java Communications API is not available to date. Click here for the Windows download of version 2.0 of the Java Communications API. The Java Communications API for Linux and Solaris is available on Sun's Java Communications API page. If you install the J2SDK, you must install the Java Communications API in the JRE directory in the J2SDK distribution. For Linux, you will also need the RXTX package available on the RXTX Web site. Unzip the Java Communications API somewhere on your disk. A commapi folder will be created. There will be three files of interest in the commapi folder: javax.comm.properties, win32comm.dll and comm.jar. You need to install these files in the JRE. If you have installed the J2SDK, you need to install these files in the JRE directory under the J2SDK distribution. Copy file javax.comm.properties from the commapi folder to JRE's lib folder. If the JRE is installed in C:\Program Files\Java\jre1.5.0_06, you need to move the javax.comm.properties file in C:\Program Files\Java\jre1.5.0_06\lib. Copy file win32com.dll from commapi folder to JRE's bin folder (you need to display system files to see this DLL). Copy file comm.jar from the commapi folder to JRE's lib\ext directory. (change the path to match your directory structure). On other Windows versions (NT, 2000, etc. ), the CLASSPATH environment variable can be set using the System utility in the Control Panel. (change the path to match your directory structure). On other Windows versions (NT, 2000, etc. ), the PATH environment variable can be set using the System utility in the Control Panel. Download Solaris SPARC version of the Java Communications API 2.0.2. Click here to download this package. Copy file comm.jar from the Java Communications API in JRE's lib/ext directory. Download the latest RXTX 2.0 source distribution (release 2.0-7pre2 has been tested successfully). Define the JAVA_HOME environment variable. Run ./configure from the RXTX directory. If not present, the javax.comm.properties file is created in $JAVA_HOME/jre/lib. Run make to build the package. Run make install to install the RXTX package. RXTXcomm.jar file will be installed in $JAVA_HOME/jre/lib/ext and two .so librairies will be installed in $JAVA_HOME/jre/lib/i386. Note that version 2.1 of RXTX is not compatible with Jolt bootloader. If the Linux version of the Java Communications API is installed, there is no need to install the RXTX package. Once the JRE and the Communications API and/or RXTX packages are installed, you can install the bootloader application. For Windows, you can run the JoltSetup.exe installer. For Linux, you can extract the Bootloader.jar and bootload.hex files from the Bootloader.zip archive somewhere on your disk. Launch Jolt executable or launch "Jolt PIC18F Bootloader" from the Start menu if you have not selected "Do not create shortcut" option during installation. from the directory where the Bootloader.jar file was installed. Option -r resets PIC after download. Option -s forces PIC to stay in boot after download. Use option -h to get a full list of options. Implement a circuit that will allow your PC to be connected to the PIC USART port (see schmematics). Burn the bootloader firmware bootload.hex, bootloadext.HEX or bootload1X20.HEX on the PIC18F microcontroller. Use bootloadext.HEX on models that have 2 kb boot block. The firmware is configured with HS oscillator type. You will want to change this if you don't plan to use a 4 MHz to 40 MHz crystal on pins OSC1 and OSC2. The rest of the Config bits can be changed afterwards with the bootloader application. Power on the PIC18F device. The first time the bootloader firmware is ran, it stays in boot mode until it receives its first program. Launch the Jolt bootloader application. If you select the Delayed boot mode, the bootloader kicks in on startup for two seconds. If it does not receive any bootloader commands, it automatically transfers to the user application (jumps to address 0x0200 or 0x0800 depending on the firmware used). If you select the User boot mode, you need to provide a way in your application code to drop back to boot mode by writing hex code 0xFF on last EEPROM address (address 0xff). Otherwise, you will not be able to enter boot mode again. I have included a test HEX file (blink-led.hex) in the Bootloader.zip archive. If you download this file using the bootloader application, LEDs connected to pin B0 to B3 should start blinking after the bootloader gives control to the user application code. I intend to support the Jolt bootloader application. So, if there are additional devices you would like to support, or have suggestions on new features, send me a mail. User code must be relocated at address 0x0200 or 0x0800 depending on the model and firmware used. The start of user space depends on the size of the boot block. Originally, the boot block for PIC18F devices was 256 bytes. Lately, most new models have a boot block of 2048 bytes. To determine the size of the boot block for your device, you may look at the PicDevices.properties file. Replace 0x200 and 0x208 with 0x800 and 0x808 for PIC devices using a 2 kb boot block. Save the content of the memory buffer in the filename shown on the window title. Save the content of the memory buffer in the specified file. Edit the Config bits. The changes are saved in the memory buffer and can be applied by executing the Program Config command. Note that when the checkbox are selected, it means that the value for the related config bit is set to 1. For instance, if CPB is selected, the CPB value is set to 1 which means that the boot block is not code protected. Edit the EEPROM Data. The changes are saved in the memory buffer and can be applied by executing the Program EEPROM Data command. Read program memory, EEPROM data and Config bits and copy content into memory buffer. You can view the results in the memory buffer area of the PIC18F Bootloader window. Program device using content of memory buffer. If the Reload before Program option is selected, the memory buffer is filled with the latest version of the file shown in the window title. If the Reset after Program is selected, after the program is loaded, the device is reset. Program the Config bits according to content of memory buffer. The Reload before Program and Reset after Program have no effect on this command. Program the EEPROM Data according to content of memory buffer. The Reload before Program and Reset after Program have no effect on this command. Compare device with content of memory buffer. Indicates which boot mode is used. Delayed means that the device goes in boot on startup for two seconds. User means that the device jumps to user code automatically on startup. If User boot mode is selected, the application must be able to drop back to boot mode by writing value 0xff at address 0xff of EEPROM data. When this option is selected, the Jolt bootloader application reloads the file shown on the windows title before every Program command is executed. When this option is selected, the Jolt bootloader application resets the device after the Program operation is completed. When this option is selected, the Jolt bootloader application also programs the EEPROM Data along with the program memory when a Program command is executed. When this option is selected, the Jolt bootloader application also programs the Config bits along with the program memory when a Program command is executed. Note that the CTRL-Home, CTRL-End, Page Up and Page Down keys can be used in the memory buffer area to navigate the the beginning, end, next page and previous page of the program memory, EEPROM Data and Config bits. The bootloader firmware is based on Microchip's bootloader firmware written by Ross Fosler. Microchip's firmware and bootloader application can be found on the AN851 application note page. Here is a list of PIC devices tested against the Jolt bootloader. The Jolt bootloader firmware is very generic and should work with all PIC18F models. where the DEVICE_NAME field specifies the device name, the DEVICE_ID field is used to identify the Device ID, LO_PROGRAM and HI_PROGRAM fields define the program code space (low and high addresses) excluding the boot sector. The LO_EEPROM and HI_EEPROM fields specify the low and high EEPROM data addresses. DEVICE_NAME is a decimal number and all other numeric fields are in hexadecimal format. 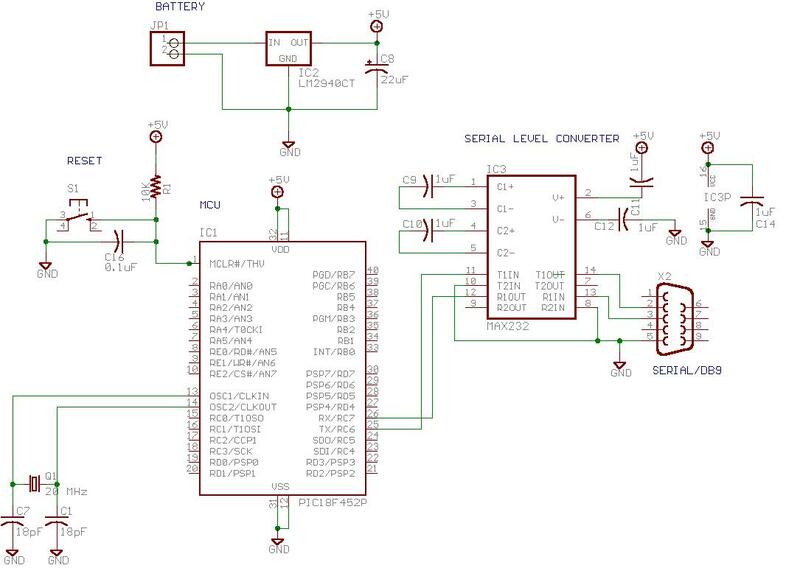 This entry tells the bootloader application that the PIC microcontroller with Device ID 67 is a PIC18F458 with program space starting at address 0x0200 and ending at 0x7FFF. The EEPROM data starts at 0 and ends at address 0xFF. The Configuration bits implemented for that device and stored between address 0x300000 and 0x30000D are: OSCSEN, FOSC20, BORV, BOREN, PWRTEN, WDTPS20, WDTEN, CCP2MX, DEBUG, LVP, STVREN, CP3, CP2, CP1, CP0, CPD, CPB, WRT3, WRT2, WRT1, WRT0, WRTD, WRTB, WRTC, EBTR3, EBTR2, EBTR1, EBTR0, EBTRB.